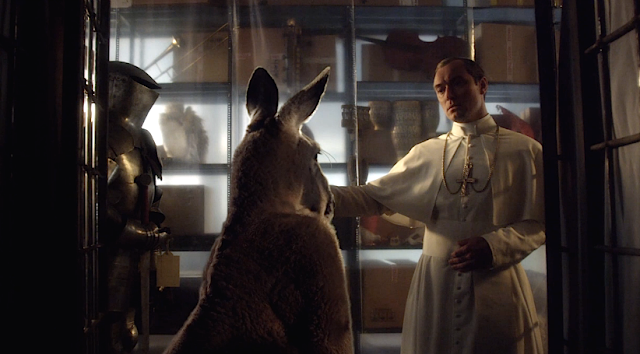 No Blogging for Old Men: The Small Screen: The Young Pope "Episode 2"
The Young Pope is back for its second episode this week, and my skeptical but excited by its well crafted oddness after the first has been rewarded. Some thoughts about this terrific step up from an intriguing premiere. - Jude Law continues to be absolutely perfect for the role, and the great supporting performance from Diane Keaton only enhances the lead even more. - After the first episode, I predicted that what was being set up as a silly premise would eventually turn completely into a serious drama. I think I am going to be correct. - Pope Pius XIII gives his first sermon to a massive crowd of people, and the scene is chilling and outstanding, his words pointing to my first point about Lenny (Jude Law) being a lot more conservative than it first seemed. - James Cromwell is a choice addiction to this show as a supporting character. I have no idea how often he will appear through the rest of the series, if at all, but his short time in "Episode 2" was excellent. - The most exciting thing about The Young Pope is that even while watching such a good episode, I was thinking man...this thing is going to get better, isn't it? Potentially A LOT better. I could feel true greatness bubbling underneath this bad boy, like a masterpiece is headed our way at some point this season. Next Sunday, January 29th. The third episode of The Young Pope will air on HBO. I will be there, and I suggest you join me.